Parkside Community Trust has taken over the White Lion Café on White Lion Street in the city centre. 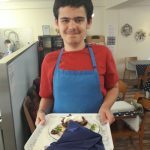 The café is run by Pathways students on a Wednesday and by students from Parkside’s Upper School on Monday, Tuesday, Thursday and Friday. 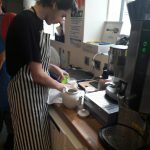 On Saturdays and during school holidays the café is run by current and past student volunteers and our Chef. 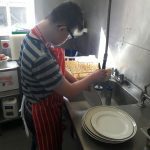 Students gain valuable work experience in the café which aims to develop their confidence, social interaction, communication, maths and literacy skills. 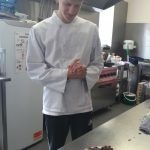 Students take it in turns to take on the roles of chef, barista and front of house staff. If you have any enquiries, or wish to volunteer in the café, please contact Debbie Wickes on 01603 441126 or 01603 626213. Barista. Making hot drinks for customers. Chef. Cooking meals for customers. Front of house. Serving customers. Washing up. Making sure plates, cutlery are clean.